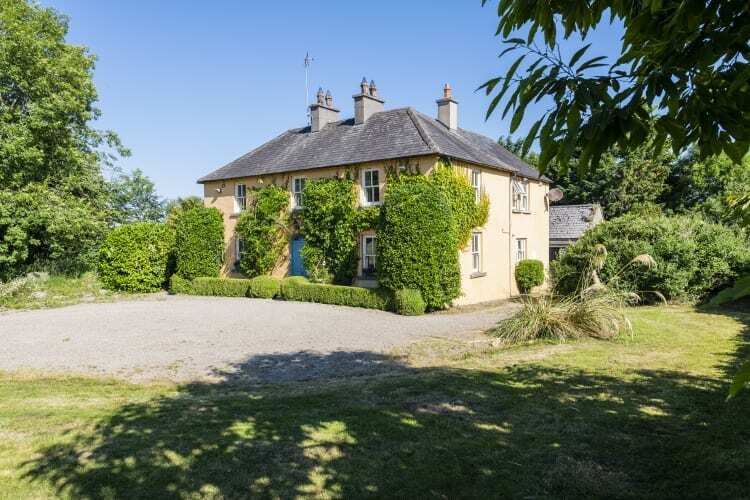 Murphy Gubbins Auctioneers are delighted to bring this early 19th century Glebe house on the outskirts of Adare to the market. The property spans circa 260m2 (2,798f2), sits on circa 1 acre with approximately 7 acres adjoining also included in the sale. The accommodation is laid out over two floors incorporating five reception rooms and 3 bedrooms including a large ensuite and the usual ancillary accommodation. Internally the property is in superb condition, with natural stone fire places, original doors, coved ceilings and beautifully crafted double-glazed timber sash windows with granite sills. The property is south facing, in a beautiful parkland setting with a variety of hardwood mature trees, shrubs and plants. The entrance gates open onto a curved gravel driveway lined with maturing hardwood trees. There are paved footpaths and there is a patio area just above the garden off the conservatory. Additionally, there are 2 stables, detached out offices and a separate driveway access via the back garden adjacent to an enclosed apple orchard /dog run. The house has oil fired central heating , a group water supply and a private septic tank and a BER rating is C1 which is exceptional for an original period Glebe house. It is not often an opportunity like this presents itself and viewing comes highly recommended.